Thousands of guests honour us with their visit every year. 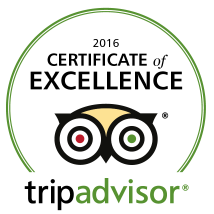 We are fortunate enough to receive wonderful and heartwarming reviews from them and as a result we have received the Tripadvisor certificate of excellence many years in a row. Our guestbook is also full of really nice comments and fun drawings, such a wonderful memory for us.